Ever since I mentioned Malai Kofta here , I keep getting E-mails from the visitors of my Rasoi , for the recipe of the same. 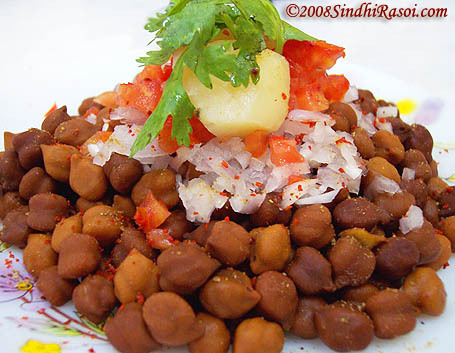 Many wished, that i post the recipe here, but I kept overlooking those requests, since it is not a traditional Sindhi dish (Though its very popular amongst Sindhis) and just kept on sending them the recipe through emails. But after emailing the same to many of you (and my apologies to those who are yet to hear from me), I finally gave in and here I am sharing this recipe with you all . Malai Kofta is basically a Moghul Delicacy, but it is Universally popular amongst Indians and many Non Indians too. Here is how I always make Malai koftas, based on the Recipe of Mrs Lavina, who runs a cookery class nearby. Feel free to tweak the recipe as per your taste and need. Place them on kitchen towel or tissue paper to get rid of extra oil. Nice recipe …Pls let me know…how long you can preserve the red and white gravy…? I have been contemplating on kofta for a while. will try ur recipe for sure. 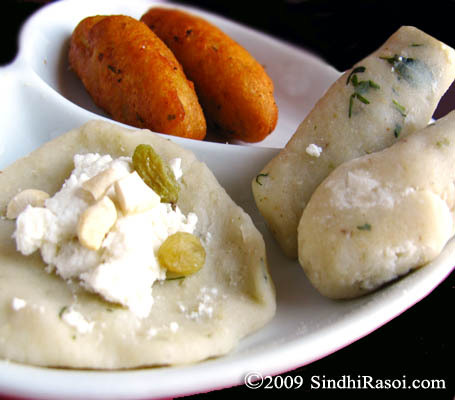 Can you suggest a filling other than Paneer for Vegans. Appreciate yr response and Thanx in anticipation! Thanks for stopping by and writing to me ! Regarding vegan stuffing,then there are multiple options. lovely Pics!!!. and very nicely step by step receipe. I love cooking and will try soon.thanks you for such a professional receipe. i was just looking for this. 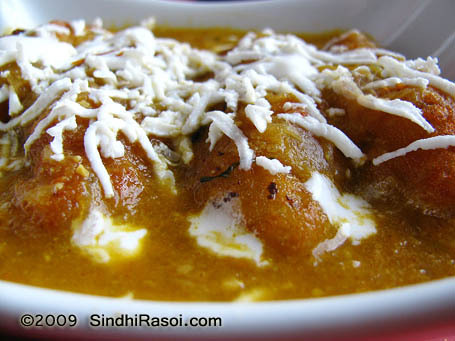 I m from USA (America) I like ur receipes and this malai kofta receipes I like too much. 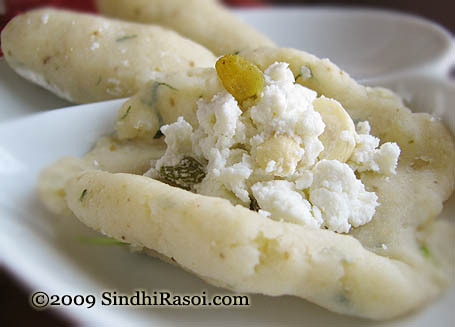 Madam pls I want more new dishes in Sindhi. Rosoi so pls help me. 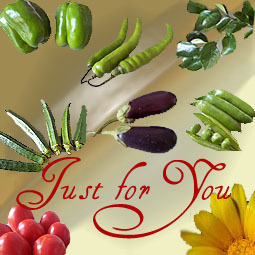 Alka, thanks for visiting our blog. Malai kofta..looks so very delicious and so are the pictures. One ? 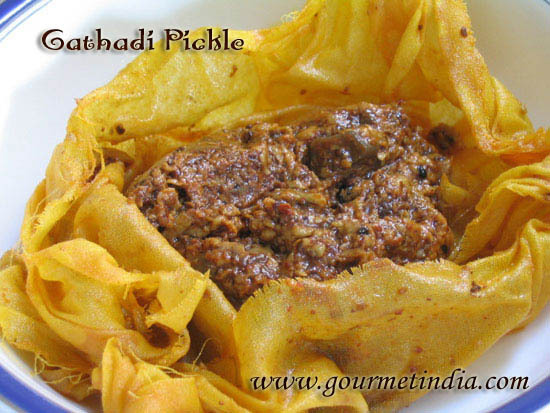 Can you suggest me with something else for making kofta like plaintain/cooking banana or any other ingredient instead of a potato if you have tried..
great recipe and brilliant presentation. your blog is such a great resource thank you for sharing. I always try to know how malai kofta is prepared in restaurant. your post is so professional. Thanks for giving this recipe. Lovely declious yummy dish and photos as usual! I simply love koftas – nowadays in addition to potato & paneer, I add peas, carrots, beans and cauliflower too. I keep the masalas very low -limited to jeera powder, black pepper, and a spec of garam masala. I am just going to eat the koftas with chutney just like tikkis. ( I’ll not have to make gravy) Good One! Malai kofta looks gorgeous… Lovely presentation and making two separate gravies is new to me. Very interesting recipe. Love Malai Kofta. Must try when in laws come 😀 That way, I garner some points no? Dish looks very tempting .I just love the way u explain all recipes very clearly and point wise,its very helpful to us……….thanks for sharing a grt dish with us………..
Lovely koftas…I am just drooling over that..
It’s a pleasure to see ur recipe pictures and read through ur recipes. clear and to the point. I liked the variations u’ve given for this dish. Thanks. Shall see u more often. You have a immpeccable crust going on in the koftas. THey say you eat with your eyes first, and I already have! Looks yum! Loved the golden Koftas..
Wooww so beautiful, i was thinking to make out malai kofta since a long, after seeing urs..am just drooling over them rite now…Gorgeous!!!! It looks so beautiful & tempting .. Very detailed steps …..
Mouthwatering. I didn’t realize the paneer was actually inside the potato filling. I just thought it was mixed up with the rest of the ingredients for kofta. Neat! And I had no clue the 2 gravies were made separate and later mixed! You explained it in real detail. I have to try it sooon. This looks so beautiful and delicious, once i roed to make them and the moment i fried them in oil i saw them just dispersing in the oil like a magic, i was so disapointed and that was the last time i tried to make veg kofta. Oh My…Alka your Rasoi is nothing less than a five star kitchen…A very professional Malai Kofta there..!! Again with the professional photographs !! Real Yummy ALka..will be trying this soon.. Happy Mothers Day to you dear !! yummy and rich koftas… love the pictures ! These are Rich Kofta’s..The best kofta, i have ever seen! Thanks for stopping by my blog. These kofta are just perfect. Now I know what I want to make for dinner tomorrow. Ur version of koftha looks really great!! 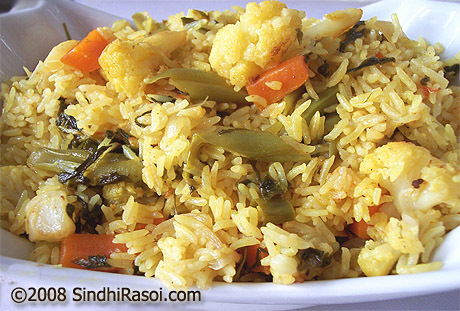 Yummy and mouthwatering delicious dish….